Can communism ever exist peacefully on the planet Earth? The Death of Stalin does not try to examine such a question, though we can’t help but see plainly the absurdity of the socialistic attempt to bring Paradise to the present world. All that happens as a consequence of overthrowing the bourgeoisie and chimerical capitalist order is a precipitous agglomeration of violent power. Stalin’s Russia is a society ordered primarily on fear, a fear from an arbitrary, tyrannical use of violence on any who oppose the master and owner of the sword. Unintended consequences and a gentle shrug of a hapless mistake in attempting to conjure Marx’s utopia is a convenient excuse for those who deny the aristocracy of nature, and the effort to build a society to resemble the promulgation of a natural order of human society; not built on the vain whims of one man, but on the aggregate decisive powers of society as a whole. The anti-capitalist is more prone to reject nature than to admit its hierarchical physiognomy, to be discontent with its providence, because ultimately, as is suggested in the film, he believes he knows what is best for society when the answer is eternally unknowable. The film is excruciatingly dead-pan in its brilliant historical fiction. In an effort to be as accurate an intimation of the reality upon Stalin’s death, it bleeds the constant fear and dismemberment of veritably self-ownership and liberty of the individual in such a deathly serious manner. All characters permanently rest on unstable fluidic grounds which swell and sway depending on the eternally present need to do so. At the same time, the comedy arises as each try to fight a war of attrition in having their opinion, their consciousness, become the dominant force. It is at base a struggle for primal power, of being able to dominate over being dominated, seen in an exceptionally crafted cinematic lens. How logical, then, that the Bolshevik Revolution, in an effort to realize Marx’s dream, only materialized the logical absurdity of Hegelry. That of the end condition of man being a pseudo-deification of one mind out of the entirety of a society. It is worse than a typical despotism, for the despot does not need to constantly assassinate in order to preserve his power. It is genuinely, hideously, a race to the bottom, of vomiting the most simian aspects of human social relations toward a dominant position in society. And yet, there is still some indestructible goodness, as Leibniz would optimistically affirm, to man. Cloaked behind the reign of terror are the Soviet charlatans seeking a way to end Stalin’s psychopathy writ large; those that are seeking to order society harmoniously. Of course, they needed Stalin’s death to unironically capitalize on the opportunity, but nonetheless the fact that there was intention to make the Soviet Union more peaceful rather than terrorizing is as strong an indicator as any of the goodness of man. Of course too, there are those cloaking similarly diametric to their goodness, seeking to the lust of absolute power above all others. Which is why, among many other factors, the eternal schism leads to a social neuropathy of order, contrasted to the spontaneous chaos of a free society and its harmonics. All to say, there is a reason the Soviet Union is no more. 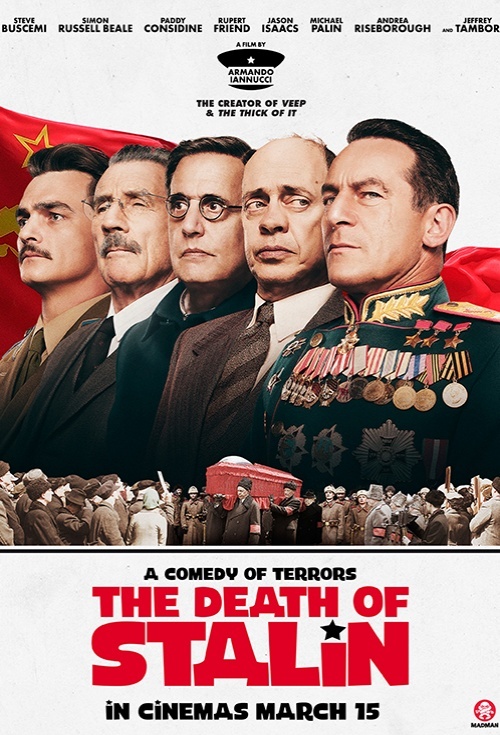 The Death of Stalin is a realistic glimpse, and even soft affirmation of Western liberal values over socialistic ones. I found, in fact, the affirmation of Christian values through the rebellious pianist to be quite touching and iconoclastic in the present Hollywood age of vilifying tradition. The film ultimately was an unexpectedly serious depiction which rendered the narratively properly, comedically absurd.